Hey folks, Poppa Large (aka Oliver) here. Sorry for being the infrequent poster I am (and as always, thanks to Jason for holding the site down with his rigor and foresight). As a quick update, my daughter is now four years old and after many years of insisting that we were "one and done," there's some (slight) shift around the resistance to having a second kid. We'll see though, we'll see. I'd also like to congratulate my co-blogger at Poplicks, Junichi Semitsu, who recently became a Rice Daddy himself with his first child, a half Japanese/half Lebanese son. Just saw this article that I thought would be of particular interest here: Jeff Yang writing about how first-born Asian American kids buck the conventional wisdom. Would love to hear what folks here think about this and how it conforms to their own experience. I know for me, it sounded rather on-point. I was definitely the rebellious first-born (though not in the awry-with-the-law sort of way) while my younger sister is the one who actually went into our dad's line of work (albeit temporarily). I saw this Omamas post on the topic of picky eaters. It's a podcast that provides advice on how to get your kid to eat a balanced diet. According to Connie Warner, the dietician, one should not force one's children to eat, one should not bribe kids with other foods, and one should not allow children to snack too much throughout the day. I'm guilty of the first two. This is a popular topic, as I saw Kimchi Mamas had a different take on the issue just last month. I guess we all have our theories and practices, and I suppose there is no single correct answer. As for me, I'm probably in between the Omamas dietician and the Kimchi Mama, but I probably lean somewhat towards the Kimchi Mama. I will sometimes heat up something different if I know my son will absolutely refuse to eat what we're eating, but I will ask my son to try different things, and I will pressure him to a certain degree. My reason is this: it's not just about diet. It's about respecting the different foods that nourish us, and it's about learning to like different tastes. I actually find it hard to go out with people who are very picky eaters, and I'd prefer that my children have a wide range of foods that they are able to eat. Enjoying a wide range of foods, I believe, opens up a wide range of social and cultural opportunities in life. Over the past several years, I've encountered increasing numbers of young Filipino-American kids from the generation right behind ours. It's refreshing to know that their desire to reconnect with the culture of their ancestral homeland is more fervent than ever before. I had the privilege of seeing Deep Foundation in our fall fundraiser for READ Philippines. I got goosebumps back then, and I got them again tonight, while watching this. I know that our own kids will probably stop looking to us as suitable role models once they hit their teen years. When that time comes, I really hope that culturally literate kids like these will be around to serve as positive role models for them. My name is Byron, and I'm happy to be the newest blogger on your site. I am the father of two children, a 2 3/4 year old boy (that's us 2.5 months ago in the picture) and a 4 month old girl, and I work in an industry that has been absolutely decimated by the financial crisis. So if you're feeling pain, I'm probably feeling it too. In addition to my day job, I am also an Asian American activist through Thymos and future fiction writer through my own blood, sweat, and tears. I blog on bigWOWO.com, my personal site, and The Fighting 44s (under the name "jaehwan"). And now I'm officially a Rice Daddy. I'm really happy and honored to be a part of your community. So for my first post, I wanted to make a public service announcement for people who drive their kids to daycare. The Washington Post published an article this past weekend on parents who accidentally leave their kids in the car: Fatal Distraction. Apparently this phenomena kills 15-25 children a year. I first heard of this phenomena on an Asian American board where an Asian American father lost his daughter, and it's both sad and worrisome. It can happen to anyone. So please read the entire article, and check out some of the precautions you can take. I personally like the idea of leaving your attache case in the back seat--basically anything that forces you to check the back after parking will prevent this tragedy from taking place. Spring begins on Sunday, and just an ounce of prevention is worth it. Thanks again for reading my blog post! I've gotten into the habit of including a You Tube video in my posts to distract from the monotony of text. When it came to choosing a video for money, I found it harder than usual to decide on one video that would best accompany the post. Cyndi Lauper doing John Mellancamp doing her original 80's New Wave classic. What's your favorite money song? Why? So, apparently, we missed our own 3rd blogaversary—-which all of you know is totally uncharacteristic of us Rice Daddies because we never forget our loved ones' birthdays and anniversaries cuz we're cool like that. 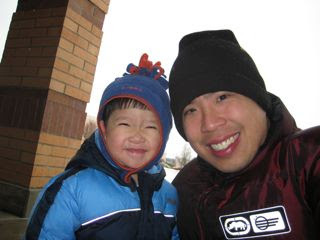 But anyway, 3 years and one month ago today, on February 6, 2006, a group of Asian American dads launched this virtual place to talk about dadhood and stuff, and spotty posting schedules and disappearing contributors notwithstanding, we're still here. We wanted to remind you of all the ways, besides commenting, that you can participate in this community. Upload your latest kidpix to our Flickr pool, from whence we get the photos at the top of your screen. Give back to the next generation by donating to our Donors Choose Rice Daddies Empowerment in Diversity Challenge (and tell your teacher friends about it too). And if you are a Rice Daddy (or soon to be one), and you would love to add your voice to the conversation here, we'd love to have you. Just email me and we'll set it all up (you don't have to have your own blog elsewhere). Finally, thanks to all of you who read and comment and link and come back even when content isn't updated as frequently as you'd want. Thank you for continuing this journey with us, into the fourth year and beyond! This is too funny for words. I thought you'd all get a kick out of it. All that's missing is a bottle of soju, sliced pineapples, and a plate of ojinga. We should be able to look every second grader in the eye and say, ‘You’re on track, you’re going to be able to go to a good college, or you’re not,’ Right now, in too many states, quite frankly, we lie to children. We lie to them and we lie to their families. Where were you in second grade? If you were to tell me 10 years ago that I would be married and a father of two, I would have responded: Really? If you were to tell me 15 years ago, I would be working on Wall Street, I would have told you: Never! And yet, here I am. Married with children and working on Wall Street. In college, I was going to change the world through art and poetry. In high school, I took a career aptitude test that said I would be best suited to be a Forest Ranger or a Radio Broadcaster. In middle school, I failed my first test because it was either that or get beat up for ruining the curve. In elementary school, I stuttered, wore thick horn rims too large for my face, and couldn't do math. If I were me then, now - If I were eight today - and Arne Duncan came to my school would he let me go to his "good" college? Would I be among his... I don't know... Anointed? Chosen? It's like something from science fiction. Do you remember Gattaca? What a dumb thing for someone in such a high profile and influential position to say! When I first heard his statements on the news, I was angry as a parent, as an educator, and as a former second grader whose family was new to the U.S., who stuttered, had vision problems, and probably had one or more as-of-then undiagnosed learning disabilities! I am still angry! But not unreasonable. Sadly, I understand where Mr. Duncan comes from. It is a "know your place" mentality that eagerly pigeon-holes people not like him into serviceable and digestible caricatures and stereotypes. For Asians, it perpetuates harmful myths about our households, our role as citizens, and ignores the impact of educational initiatives/programs on our community. And of course data will be collected to create and justify the molds that Duncan and his supporters will establish in their "Gattacization" of education. I am not saying data is not useful in informing how teachers teach, how students learn, and how critics criticize. I am saying data is just numbers. Who will be allowed to determine what the numbers mean? And who will be collateral damage in the narrowing definition of effective teaching and learning? Watching the trailer for Gattaca, it is unsettling how well it reflects the world Duncan and his cronies wish to create. The world where a test or a battery of tests in second grade will determine an individual's future prospects. Diane Ravitch makes some keen inferences in her post on the blog that captures her virtual dialogue with Deborah Meier, Bridging Differences. She points out that appointing Duncan as Education Secretary extends the harmful policies of No Child Left Behind into at least the next four years. She notes that Arne Duncan chose to visit a charter school in Brooklyn instead of a regular public school. She is peeved about his desire for more testing and greater expenditures for churning out data. And she is befuddled by the very comment I am so angry about. Wow! More testing is needed. In New York City right now, students take a dozen tests a year. How many more should they take? How much of the stimulus package will be used to promote more testing across the country? Are we lying to children? Deborah, you were principal of an elementary school. Could you look second-graders in the eye and tell them that they were on track to go to a good college—or not? Did you know? Did you lie and say that they were when they were not? In 2008, the Asian Legal Defense and Education Fund released, Left in the Margins: Asian American Students and the No Child Left Behind Act. The report presented the predominantly negative impact NCLB policies on Asian American students. Much to my dismay, it didn't rally against testing enough. Instead it requested additional resources be devoted to preparing students for the tests. I began the year writing about the need to dream, especially in this day and age. My wife and I have this ongoing argument about what education could be and what education is. She thinks I'm an idealist. She thinks I am well intentioned but ignoring reality. She and many parents like her believe the defining characteristic of a good school is one that prepares students to do well on high stakes tests. Subject matter is secondary. After all, students are not judged on their grasp of subject content but on their test scores. To bastardize the line from Gattaca: Where is the test of dreams? Ambition? Innovation? and Resourcefulness?